Seattle No. 7 on list of cities with worst traffic in U.S. Overall, Americans experienced 6.9 billion hours of traffic delays in 2014 compared to 6.6 billion in 2007 and 1.8 billion in 1982. Seattle made the top 10. 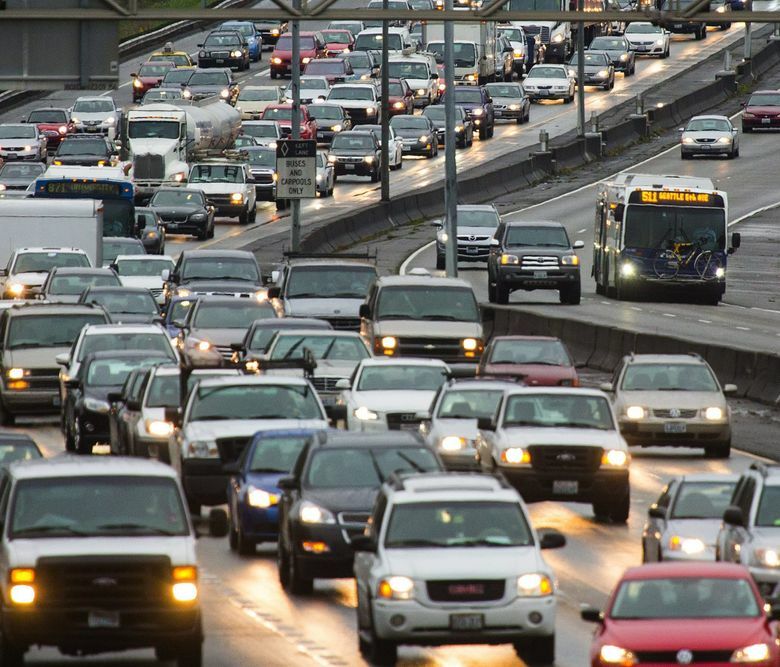 WASHINGTON — U.S. roads are more clogged than ever, a new study has found, and Seattle ranks No. 7 on a list of cities with the most traffic congestion. Overall, American motorists are stuck in traffic about 5 percent more than they were in 2007, the pre-recession peak, says the report from the Texas A&M Transportation Institute and INRIX, a Kirkland-based firm that analyzes traffic data. Commuters in Washington, D.C., suffer the most, losing an average of 82 hours a year to rush-hour slowdowns. Los Angeles, San Francisco and New York come next on the list of urban areas with the longest delays. Rounding out the Top 10 worst commuting cities are San Jose, Boston, Seattle, Chicago, Houston and Riverside-San Bernardino. Four out of five cities have now surpassed their 2007 congestion. Cities with fast-growing economies and the most job growth are the most plagued by traffic. Other factors: Urban populations are increasing and lower fuel prices are making driving less expensive, so more people are taking to city roads. Congestion increased in 61 of the nation’s 101 largest cities from 2012 to 2013, the data showed. The following year, nearly all cities — 95 out of 101 — experienced greater congestion. The findings are based on federal data about how many cars are on the roads and on traffic-speed data collected by INRIX on 1.3 million miles of urban streets and highways. The growth is outpacing the nation’s ability to build the roads, bridges, trains and other infrastructure to handle all these people on the move. Congress has kept federal transportation programs teetering on the edge of insolvency for nearly eight years because lawmakers have been unwilling to raise the federal gas tax and haven’t found a politically palatable alternative to pay for needed improvements. “Our growing traffic problem is too massive for any one entity to handle — state and local agencies can’t do it alone,” said Tim Lomax, a co-author of the report. The report recommends a mix of solutions, including making existing road and transit systems more efficient, encouraging more flexible work schedules, adding capacity to high-growth travel corridors and creating more high-density neighborhoods where homes, offices, stores and other development can be reached through walking, biking or public transit. Overall, Americans experienced 6.9 billion hours of traffic delays in 2014 compared to 6.6 billion in 2007 and 1.8 billion in 1982. • Trucks account for about 18 percent of urban congestion, although they represent just 7 percent of urban travel. • The cost of congestion to the average auto commuter was $960 in lost time and fuel in 2014, compared to an inflation-adjusted $400 in 1982. • About 40 percent of delays occur in midday and overnight hours, making it more difficult to avoid delays by avoiding commuter rush hours. • Severe or extreme congestion levels affected one of every four trips in 2014, up from one in nine trips in 1982. The report comes on the heels of other evidence that Americans are embracing driving more than ever. The Department of Transportation said Americans drove more than 3 trillion miles in the last 12 months, surpassing the previous record set in 2007. And the National Safety Council said preliminary data for the first six months of this year shows traffic deaths are up 14 percent, a turnaround after years of fewer fatalities. If the economy remains strong, congestion will continue to worsen, the report projects. In the next five years, the annual delay per commuter would grow from 42 to 47 hours, the total delay nationwide would grow from 6.9 billion hours to 8.3 billion hours, and the total cost of congestion would jump from $160 billion to $192 billion, researchers estimated.